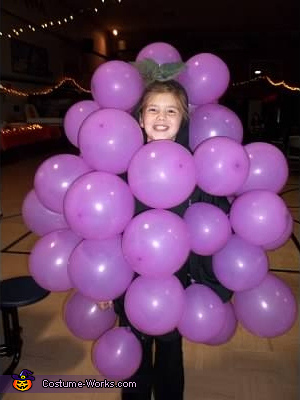 My daughter came up with the idea of grapes for a Halloween costume, so we pinned a punch of purple balloons on to a big hooded sweatshirt and added some grape leaves. It was so easy and she could easily take the costume on and off. She won first place in the halloween costume in town.